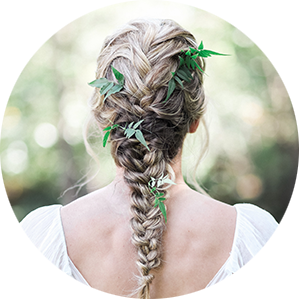 Customizing hairstyles for women in their everyday lives and providing that personal touch on their wedding day. I absolutely loved working with Jade for my wedding. She was very accommodating and made myself and my wedding party look amazing for my wedding. My hair and makeup look picture perfect all day long and until the night was over. Jade was very good at going with an idea I had for my hair and making it even better than I planned. Awesome! Jade did such a great job! Jade has incredible taste and her styles come out amazing. We worked out all of the details in no time, and when I went in for my trial, she was so patient with me and my indecisiveness. At the trial I knew I found a friend and the style of hair I was going to walk down the isle with. The morning of, Jade came over to my girls gathering and did my hair and make up beautifully, lent my friend hair tools, and did my mom’s lashes. She went above and beyond on this very special day! I am so grateful for her!!! Very easy going and is able to make decisions for the best when you yourself are unsure what to do! Highly recommended. Just had a great cut/color experience with Jade. She totally transformed my hair in one session. Came in with too light-scraggly hair and left with a great new color and cut. She’s also really sweet and fun to talk with., too. I’ve been to lots of salons in all the major cities (Chicago, NYC, San Fran) and my experience and results with Jade ranks really high. Highly recommended! Loved working with Jade! She came highly recommended by our photographer and traveled into Colorado Springs for our outdoor wedding. She was fantastic and really made my hair magazine spread quality! I was dead set on a floral crown (see pictures) and she definitely helped make that a reality. When the florist made it slightly oversized (….sooo many flowers! lol) she knew how to make it work. She also did my day of- makeup and it came out natural and flawless. She is a true artist-All in all, my hair has never been done more beautifully…the pictures here speak for themselves…GORGEOUS HAIR. That’s exactly what you’ll get with Jade! Ask for Jade! She is amazing! I went to her to get extensions because I cut my hair super short with my old hairdresser and ended up missing my long hair! She matched the color up perfectly (and I am a blonde so that’s not easy!) and put them in the next week! They are FABULOUS! I went back to her to get my hair highlighted and have the extensions re-tabbed. Again, fabulous job. As a blonde, I am very particular about the color of blonde that someone puts in my hair and she did an awesome job. Would highly recommend her!